Eta Colleges International is a Canadian not-for-profit corporation established to enable quality leadership education in Sub-Saharan Africa. A leadership that has the vision, will and power to bring about resource efficiencies and social justice. Find out how you can give. 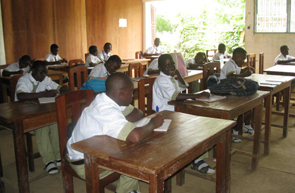 Help the students of Eta College by donating money towards a new musical instrument, electronical device or text book. Schools: To operate schools that will produce future African leaders capable of addressing African problems; leaders who will stand out for truth and point out malpractices. Schools that focus on fast learners who are capable of leadership, social interest and ethical behaviour. Students selected for Eta Colleges are prepared for GCE (General Certificate of Education) O levels and A levels (UK) to achieve university entrance. Programs on campus include: a reading centre as well as seminars, workshops, summer camps and training. Export programs include: local media programming, literacy programs, book and video sharing, parenting and teacher education, testing in math and languages. 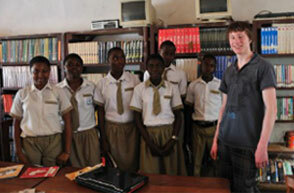 Eta Colleges International is currently growing their school in Kumba, Cameroon. Progress on the school can be seen in our online Photo Archive and the updated Photos 2016 album.